Declaration of holiday on 07.10.2019 in lieu of opening of the Institute on 30.03.2019, on account of Students Parliament Election. Utilization of 24 Air coolers at GTAC. कार्याकल में द्विभाषी हिंदी टंकण की-बोर्ड उपलब्ध कराने के संबंध में |. Conduct of Govt. Audit on 'Risk Assessment'. राजभाषा हिंदी से संबधित कार्यो हेतु एक कार्मिक (गैर - शैक्षणिक या शैक्षणिक ) को नामित किए जाने के संबंध में . Consequent upon joining of Prof. S. K. Singh as Vice -Chancellor, BBAU, Lucknow, Prof. S. K. Shrivastava is appointed as Head, Dept of Pharmaceutical Engg and Technology. The payment of wages to daily wager in different Departments/Section/Units/Hostels will be regulated in terms of Office Memorandum no.49019/1/95-Estt.-(c) dated 19.07.2017. Notification regarding implementation of revision of allowances of faculty, scientific/design and non-teaching staff of the Institute. Institute has been identified as one of the "Regional Coordinating Institute" to contribute in the implementation of Unnat Bharat Abhiyan. Women Grievance Cell shall be looked after by the Internal Complaints Committee constituted in pursuance of "The Sexual Harassment of women at workplace (prevention, prohibition and Redressal). Declaration of holiday on 22.03.2019 and 25.10.2019 in lieu of opening of the Institute on 09.02.2019 and 10.02.2019, on account of Institute Centenary Celebration. Notification regarding continuation of Heads/ Coordinators. Registration of Design Mentor for Smart India Hackathon 2019. Implementation of revision of allowances of faculty, scientific/design and non-teaching staff of the Institute. Institute will remain open on 09th February 2019 (Saturday) and 10th February 2019 (Sunday) like any other working day, on account of Centenary celebration. Centenary Celebrations-Inaugural Function, 9th February 2019. Notification regarding the submission of Immovable Property Return by the Group 'A' and 'B' employees of the autonomous bodies. Messages of Prime Minister for Centenary Celebration of IIT (BHU), Varanasi. Invitation of rate of interest from public & private sector banks for the investment of surplus fund of IIT (BHU). Digital Launch of Rashtriya Uchchatar Shiksha Abhiyan (RUSA) Projects by Hon'ble Prime Minister on 3rd February 2019 . Notification regarding Closed Circuit Television (CCTV) Cameras installed at various places in the Institute. Time Schedule for the Submission of Orders & Bills, etc. for the year 2018-19. Pariksha Pe Charcha 2.0 (Pariksha ki Baat PM ke Sath). Flag Hoisting Ceremony on the occasion of the Republic Day i.e on 26th Jan, 2019. Information for vacation of Quarters of IIT pool by faculty and non-faculty. DIC Boot Camp Programme (17th Jan. 2019 to 27th April 2019). Empanelment of two Super Speciality Hospitals outside Varanasi. Notification regarding procurement of Good and or Services on GEM. संस्थान में राजभाषा के प्रगामी प्रयोग से संबन्धित १अक्टूबर, २०१८ से ३1 दिसंबर, २०१८ को समाप्त तिमाही की प्रगति रिपोर्ट प्रेषित करने के संबंध में|. Institute level Standing Committee has been constituted to consider the recommendation of Departmental Condemnation Committees for condemned/obsolete articles. Regarding submission of documents(s) related to Rebate on Income Tax. Volume 3, Issue 2 The Institute Newsletter, September 2018. Constitution of Committee to look into the aspects of Medical Reimbursement. Committes for Allotment of IIT Pool Quarters/Houses and Flats in GRTA. Procedure for booking of Air tickets on LTC- Compliance of Instruction reg. Notification regarding prior permission before leaving the station. 7th Convocation of the Institute will held on 29 Dec, 2018. Re-constitution of Institute Works Committee. Implementation of Government e-marketplace(GEM) process. procurement of furniture in case of urgent requirement. Registation of the Institute with GFR (2017). GST on Tender Fees/Tender Processing Fees (Non-refundable) and on penalty in case of violation of terms of contract. Constitution of Students Counselling Servics(SCS). The Institute shall observe Five-Day week from 1st January, 2019. Notification regarding the reconstituted of Furniture Purchase Committee to carry out the Purchase of furniture by the Department/Schools. Notification regarding "Integrity Pledge" during Vigilance Awareness Week- 2018-reg. Notification regadring Observation of Vigilance Awareness Week- 2018-reg. Notification regadring the committee constiuted for "Space Audit and Allocation". Notification regarding the committee constiuted for "Manpower Audit". Notification regarding Committee on Anti-Plagiarism. Notification regarding the Abesntee Statement/leave records in respect of Faculty and Non-faculty membars of the Institute. Notification regarding closing and opening time of barricades. Notification regarding empanelment of 4 Super Speciality Hospitals outside Varanasi for providing treatment facility. Notification regarding the submission of life certificate, certificate of Re-marriage etc. To the pension section of the institute. Notification regarding Submission of Self Declaration Form for the purpose of Income Tax. Leadership for Academicians Program (LEAP). Registrations now open. Notification regarding the Applicability of Tax deducted at source (TDS) under GST as specified u/s 51(1) of CGST Act. 2017. Notification regarding Senate Undergraduate Committee (SUGC) and Senate Postgraduate Committee (SPGC) for the session 2018-19. Notification regarding the revised guidelines for utilisation of CPDA. Notification regarding the reimbursement of Mobile charges to faculty members. Prof. Santosh Kumar, Department of Mechanical Engineering has been appointed as Professor-in-Charge, Main Library of the Institute in place of Dr. S.K.Gupta, Chairman Senate Library Committee for a period of one year. The holiday on account of Muharram will be observed in the Institute on 21.09.2018 (Friday) in place of 20.09.2018 (Thursday), as notified earlier. Notification regarding the Utilisation of CPDA. Dr.Puneet kumar Bindlish, has been appointed as Faculty Incharge, Alumni Affairs. Notification regarding withdrawal of existing rate contract. 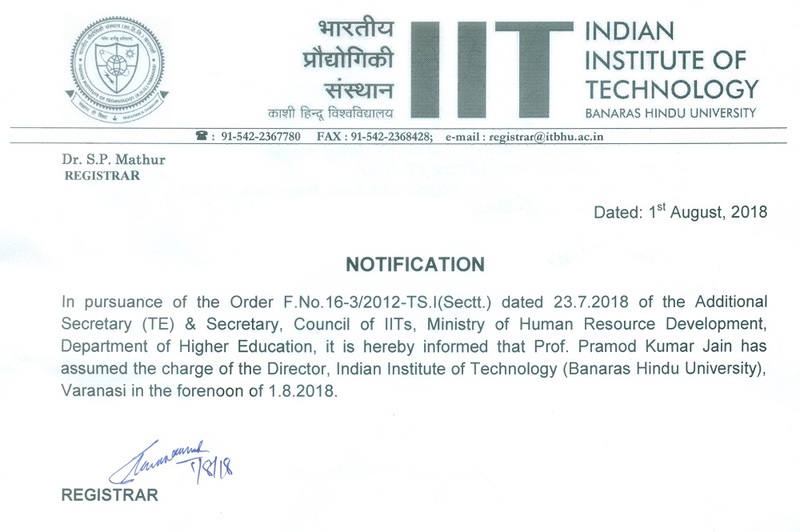 Notification regarding Commencement of Non-Formal Sanskrit Education at iitbhu from Aug.31, 2018 to April 2019. Circular regarding income tax (F.Y.2018-19). Notification regarding issuance of endorsement certificate for project submission. The holiday on account of Id-ul-Zuha (Bakrid) will be observed in the Institute on 22.08.2018 (wednesday) in place of 21.08.2018 (Tuesday), as notified earlier. Due to sad demise of Shri Atal Bihari Vajpayee, former Prime Minister of India on 16.08.18, the Government of India, has decided that SEVEN days of State mourning from 16.8.2018 to 22.8.2018. Notification regarding the delegation of financial powers in respect of institute works departments and other offices of the institute. Notification regarding enhancement of sitting fee for all the external experts/members. Notification regarding the grant for the House Building Advance(HBA) within the resources available. Notification regarding the grant for the purchase of Personal Computer within the resources available. Notification regarding the modalities for submission of GST for imparting training to the employees. 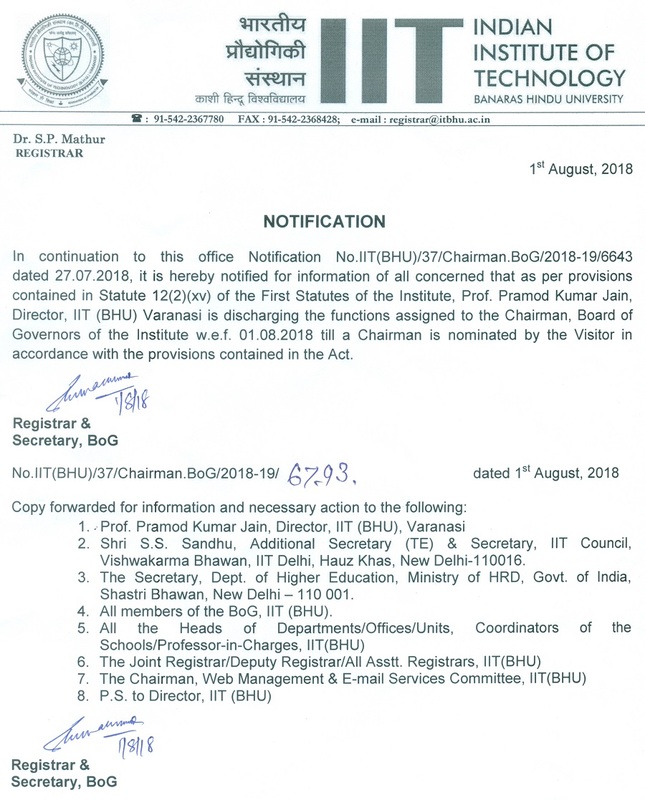 Notification regarding the nomination of members of the Board of Governors IIT(BHU). The Institute will observe half-day holiday today on 17.8.18 (Afternoon) to pay homage to Shri. Atal Bihari Vajpayee, formar Prime Minister of India. Notification regarding the installation of Air Conditioner for faculty members. Notification regarding the Flag Hoisting Ceremony on the occasion of the Independence Day i.e on 15th August,2018. Prof. P. K. Jain, Director, IIT(BHU) Varanasi is discharging the functions assigned to the Chairman, Board of Governors of the Institute. Prof. Pramod Kumar Jain has assumed the charge of the Director, Indian Institute of Technology (BHU). Notification regarding purchases of the Departments/Schools/Units/Offices till new store purchase manual of the institute comes into force. Notification regarding (old but working) computers lying in the Departments/ School/ Units/ Offices of the Institute. Notification regarding reconstitution of grievance committee for non-faculty staff members. Notification regarding the designation of the member secretary of the workshop committee/workshop purchase committee. Hostel allotment scheme for the students of IIT(BHU) for academic session 2018-19. Notification regarding reconstitution of the workshop committee/workshop purchase committee. Reimbursement of Mobile Charges for the Heads of departments/coordinators of the School of the Institute. Notification regarding Constitution of Anti-Ragging Squad for session 2018-19. Notification regarding registration of Institute with GeM (Government e-Market Place). Notification regarding extension of the term as Hostel Wardens. Gymkhana Council of the Institute for session 2018-19. TDS on payment to contractors/ sub contractors and TDS on payment made towards fees for professional/ technical services. The post of "Deputy Chief Proctor" of the institute has been redesignated as "Joint Chief Proctor", with immediate effect. Prof. V .K Srivastava, Department of Mechanical Engineering has been appointed as Professor Incharge of Main Workshop. Revision of pension/family pension of pre-01.01.2016 and post-01.01.2016 retired faculty and non-faculty of the Institute. MoU signed to adopt Amazon Web Services Educate program and establish an AI and Cloud Computing Research Lab in IIT (BHU), Varanasi. Notification regarding the hospitals empanelled for providing OPD treatment facilities on cash payment basis and indoor treatment on cashless basis. Implementation of Public Financial Management System (PFMS)/Expenditure,advance and transfer(EAT)module in central sector schemes. Prof. R.K.Misra has been appointed as Head of the Department of Humanistic Studies for a period of the three years. Prof. A. P. Harsha has been appointed as Head of the Department of Mechanical Engineering for a period of the three years. "Computer Unit" of the Institute has been renamed as "Centre for Computing and Information Services (CCIS)". Final List of selected candidates for admission in Pre-Ph.D under QIP (2018-19). Notification regarding newly appointed Head of the Department of Electrical Engineering, Electronics Engineering , Department of Chemistry and Department of Pharmaceutical Engineering. Payment of interest on GPF/CPF accumulations to the employees be made as per the interest rate fixed by the Government of India. Declaration of holiday on June 09, 2018 (Saturday) in the Institute in lieu of opening of Institute on 18.02.2018 , on account of Institute day and Technex. Delineation of Functions of Deans'/Registrars' Office and in continuation to Notification no. IIT(BHU)/2016-27/DOF/1198 dated 25.04.2016. ISTM Annual Training Calendar 2018-19 regarding training in different courses. राजभाषा के प्रगामी प्रयोग से संबन्धित १ जनवरी , २०१८ से ३१ मार्च, २०१८ को समाप्त तिमाही की प्रगति रिपोर्ट भेजने के संबंध में. The institute will observe on Saturday, 14th April, 2018 on account of birthday of Dr. B. R. Ambedkar. Regarding the appointment of Council of Wardens, IIT (BHU). Prof S. Jit will Continue to act as Head of the Department of Electronics Engineering Till further orders. OFFER OF ITALIAN GOVERNMENT SCHOLARSHIP 2018-2019. Regarding election duty in Student's Parliament Election 2018-19. New Discovery: A New Polymer based Nanomedicine for Treatment of Malaria. Notification for Allotment of SBRA Quarters for Married Research Scholars. Application Form. List of empanelled hospitals within the city, to provide cashless facility for indoor treatment. Expression of Interest (EoI) for Group Health Insurance Policy.